Rush49.com, a southern California-based online adventure and adrenaline deals site, in exclusive partnership with the National Space Society, is now expanding its repertoire of high-octane racing/driving experiences and themed outdoor events and excursions to include a foray into the final frontier—space. For the 33rd annual International Space Development Conference, “A Space Renaissance”, to be held May 14-18, 2014 at The Sheraton Gateway in Los Angeles, Rush49 will be offering a limited number of special admission tickets. Dedicated to and in the pursuit of exploring space as the final frontier, the conference will feature speakers including, but not limited to, Elon Musk (SpaceX, Tesla Motors) Buzz Aldrin (astronaut and second man to person to walk on the moon) Gwynne Shotwell (SpaceX) and the Science Channel’s “Meteorite Man,” Geoff Knotkin. Admission to this seminal conference—uniquely positioned at the intersection of technology, business, science and space—will be made available on Rush49.com. Rush49 will be offering admission to the NSS Governors Dinner, Friday, May 16th, with astronauts, space engineers and pioneers, culminating in an awards presentation and remarks by Elon Musk, as well as entrance to the ISDC event on Saturday, May 17th. Finally, the all-inclusive package allows admission to both the aforementioned VIP dinner on Friday as well as the ISDC event on Saturday. University students and faculty will receive a discount when they register with their .edu email address. Rush49 will continue to maintain and add to the stable of branded high-octane, high-adrenaline experiences like the Rusty Wallace and NASCAR Driving Experiences, skydiving trips, watersports thrills, themed 5K events and adventure runs that originally put the deals site on the map. For April Fools, we had a little fun at our coworkers’ expense. 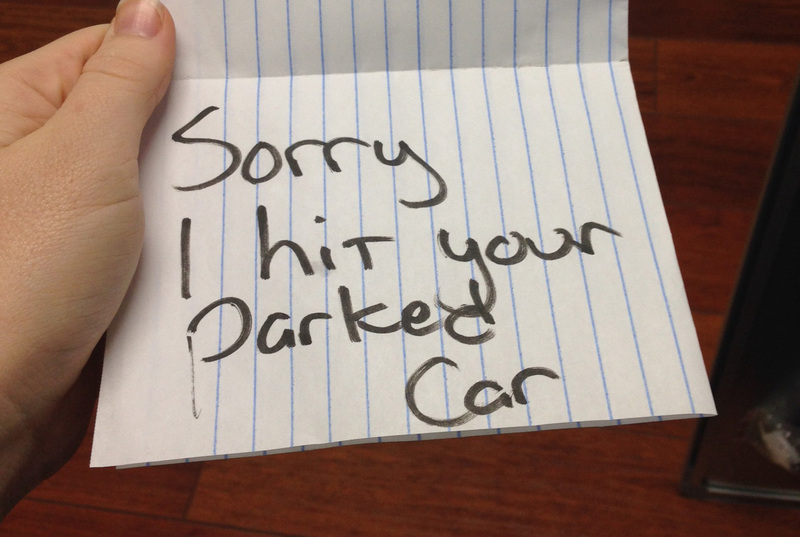 We placed a note on each victims windshield that read “Sorry I hit your parked car,” then came back into the office telling them there was something on their window.